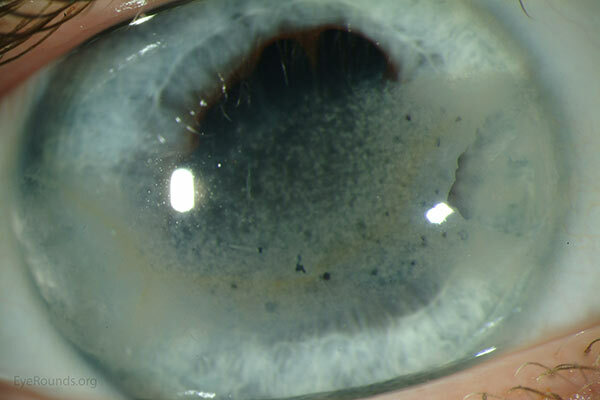 A 71-year-old female was referred for evaluation of a corneal scar in the right eye (OD). Ten years previously she had been informed that the scar was present when she was evaluated for painless and slowly progressive vision loss. She attributed the scar to a "fan injury" that she experienced at 20 years of age. Over the last ten years, she has experienced further painless vision loss OD. The vision in the left eye (OS) has been excellent. Figure 1. Band-shaped, horizontal, gray-white, subepithelial opacity in the interpalpebral fissure with involvement of the visual axis. 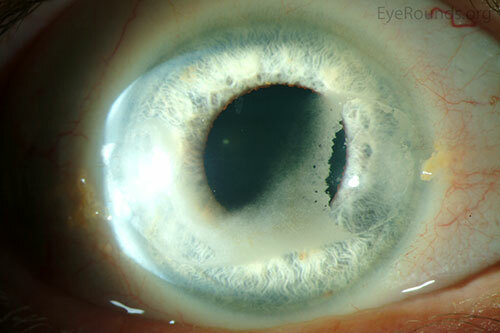 A moderately dense nuclear sclerotic cataract is present. This particular type of band keratopathy responds favorably with superficial keratectomy followed by EDTA chelation. Manual polishing with a diamond burr or excimer laser will not be needed if the underlying Bowman's layer is a smooth optical surface. The patient was treated with a manual superficial keratectomy using ethylenediaminetetraacetic acid (EDTA) chelation, followed by cataract extraction with intraocular lens implantation. The best corrected visual acuity in the right eye improved from counting fingers at 1 foot to 20/250 after treatment of the band keratopathy. 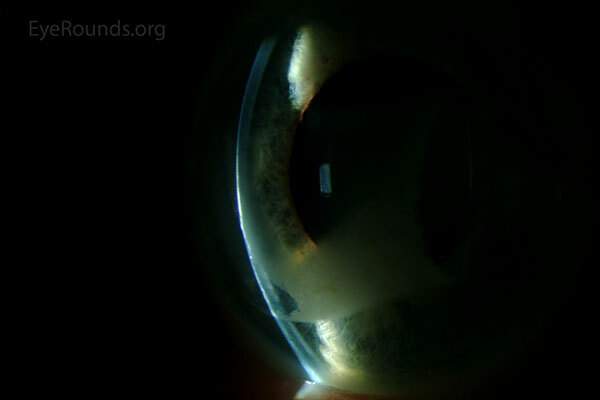 There was further improvement to 20/50 after removal of the cataract. The residual visual deficit was due to non-exudative age-related macular degeneration and an old central retinal vein occlusion, which was seen for the first time through the now clear optical media. Calcific band keratopathy is a corneal degeneration that is characterized by subepithelial deposition of calcium, primarily in the form of hydroxyapatite, in the epithelial basement membrane, Bowman's layer, and the anterior stroma (1, 2). Initially these deposits are gray (Figure 2), but may become chalky-white as the degeneration progresses (Figure 3). There is a characteristic horizontal and vertical pattern of distribution of the calcific deposits as the degeneration slowly progresses over a period of months or years. It typically begins just inside the limbus in the 3:00 and 9:00 periphery (Figure 2). There is a characteristic sharply demarcated edge separated from the limbus by a lucent zone. This zone may be due either to the lack of Bowman's layer in the extreme periphery of the cornea or the buffering capacity of limbal vessels, which prevent deposition of calcium. As the degeneration progresses, it spreads centrally in a "band-like" distribution, eventually affecting the visual axis (Figures 3, 4). The diseased segment generally remains confined to the interpalpebral fissure but may extend toward the inferior cornea in severe cases (Figure 3). Lucent holes may be scattered throughout the opacity; these represent corneal nerves that penetrate Bowman's layer (Figure 4). Initially, the calcium deposits are confined to the epithelial basement membrane and anterior surface of Bowman's layer. With progression, the deposits may extend anteriorly and break through epithelium. This may produce symptoms of irritation and foreign body sensation and cause recurrent or persistent epithelial erosions. The deposits also may extend posteriorly to penetrate Bowman's layer and enter into the superficial stroma. Hyaline-like material may be deposited in the subepithelial tissue, giving the appearance of a second Bowman's layer. 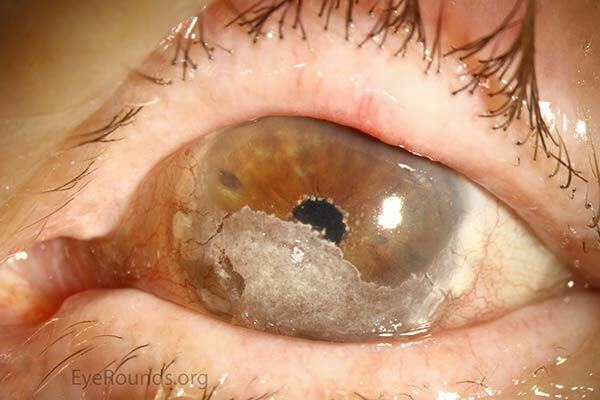 Calcific band keratopathy may be confused clinically with climatic droplet keratopathy (a.k.a spheroidal degeneration) and urate keratopathy, both of which present with a similar distribution of pathology. Climatic droplet keratopathy is distinguished from calcific band keratopathy by its occurrence in endemic regions, the more globular nature of the deposits, and the absence of calcium. Urate keratopathy is distinguished by the brown color of the deposits. Figure 2. Early band keratopathy, with a surrounding iron line, associated with juvenile idiopathic arthritis. The accompanying iron line denotes the chronicity of the lesion. Figure 3. 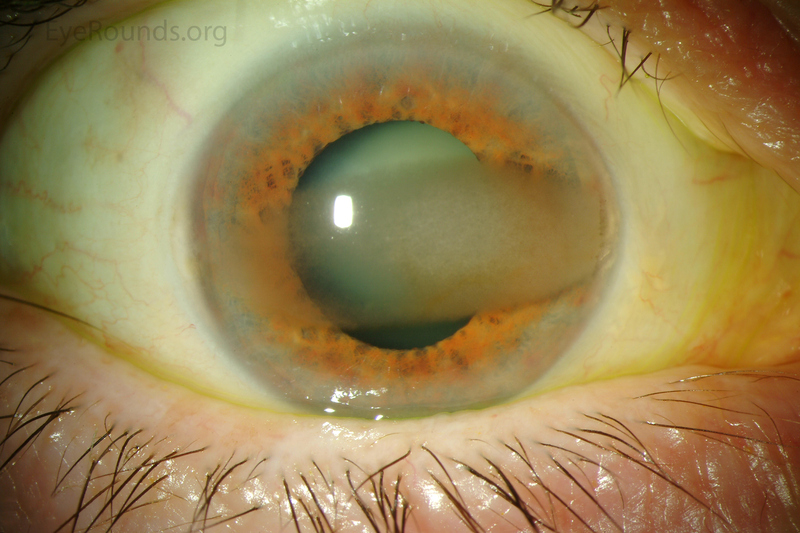 Late band keratopathy displaying a chalky, white consistency. Figure 4. Late band keratopathy secondary to chronic HLA-B27-associated uveitis. The "Swiss cheese" appearance derives from lucent "holes" in the calcific pattern due to corneal nerve penetration through Bowman's layer. Patients should be questioned about previous ocular therapy and topical medications, as well as excessive use of vitamin D and calcium supplements. A reasonable baseline evaluation includes a urinalysis and serum calcium, phosphorus, uric acid, blood urea nitrogen, and creatinine. If the patient displays signs or symptoms suggestive of hyperparathyroidism, as summarized by the classic mnemonic "stones, bones, abdominal groans, thrones, and psychiatric overtones," parathyroid hormone (PTH) levels should be obtained. Similarly, if sarcoidosis is suspected, angiotensin-converting enzyme (ACE) and lysozyme levels should be drawn and a chest x-ray should be obtained. 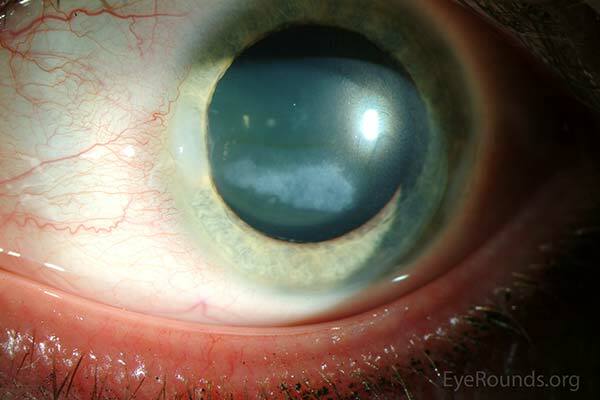 Patients with calcific band keratopathy are typically asymptomatic and can appropriately be managed with observation. Mild ocular irritation can be managed with lubricating drops, gels, and/or ointments (1-3). Moderate-to-severe irritation can be managed conservatively with a bandage soft contact lens. A rigid gas-permeable hard contact lens or scleral lens can be used, if the visual axis is clear, to correct visual impairment due to irregular astigmatism (Figure 5). Figure 5. Paracentral band keratopathy associated with hyperparathyroidism that is inducing irregular astigmatism. The best corrected visual acuity improved from 20/50 with spectacle correction to 20/20 with a rigid contact lens. Surgical treatment is offered for band keratopathy with visual impairment and/or ocular surface discomfort that cannot be adequately managed with conservative measures. Because of the anatomic location of the calcific deposits, superficial keratectomy is the procedure of choice (3-9). This can be performed manually, with or without chemical chelation (3-5), or with excimer laser phototherapeutic keratectomy (PTK) (5-9). Traditionally, manual dissection and removal of calcific deposits has been the treatment of choice for symptomatic band keratopathy as the underlying Bowman's membrane is usually still a good refracting surface (3). This simple procedure can be performed on an outpatient basis in a minor treatment room with the use of an operating microscope and topical anesthesia. In many cases, a clean plane can be identified between the calcific deposits and normal cornea, thereby permitting simple dissection and removal with a 57 Beaver blade. We typically supplement with EDTA chemical chelation to facilitate more complete removal of the calcium deposits as manual superficial keratectomy can leave an irregular refractive surface and poor vision if performed too aggressively (4, 5). Disodium EDTA is no longer commercially available, but can be obtained through compounding pharmacies for the procedure. Our chemical chelation technique begins with manual debridement of corneal epithelium and underlying loose calcific deposits with an Amoils scrubber and/or 57 or 69 Beaver blade (Video 1). We then apply a filter paper disk soaked in 3% EDTA solution to the subepithelial calcium for intervals of approximately 3 minutes, followed by a thorough rinse with balanced salt solution. We feel there is less risk for limbal stem cell damage when the EDTA is contained within the filter paper and have never observed toxicity from deep penetration past Bowman's layer. Other options for application of EDTA include a sterile cotton tip applicator, cellulose sponge, or a reservoir, such as a corneal trephine, to hold the solution. Further dissection is then performed with a Beaver blade when appropriate, and the 3 minute cycles of EDTA application are repeated until there is satisfactory removal of calcium. We do not routinely polish Bowman's membrane, but occasionally use a battery-operated diamond burr or plan for excimer laser PTK if there is known destruction of Bowman's membrane at the end of the procedure. Postoperatively, a bandage soft contact lens and prophylactic topical antibiotics are used until the epithelial defect has healed. The prognosis for visual improvement and relief of symptoms is excellent after EDTA chelation for band keratopathy (3-5). More than 95% of patients experience partial or complete symptomatic relief (4). Vision improvement commensurate with the degree of visual axis involvement can be expected in most cases (4), although visual rehabilitation may be limited by existent pathology in the posterior segment. Excimer laser PTK has become increasingly popular as an alternative to manual superficial keratectomy in the management of superficial corneal pathology (5-9). The procedure removes approximately 0.25 µm of normal corneal stroma (or 1/2000th of the corneal thickness) per pulse, thereby permitting more precise removal of the desired depth of anterior stroma with less postoperative scarring than manual techniques, especially if mitomycin C is applied at the conclusion of the procedure. Unfortunately, excimer ablation of anterior stroma can be associated a hyperopic shift that is proportional to the total depth of the ablation. The introduction of scanning excimer laser models has reduced, but not completely eliminated, hyperopic shifts associated with this procedure. Of greater concern, pathological tissue (especially calcium) ablates less effectively than normal tissue. 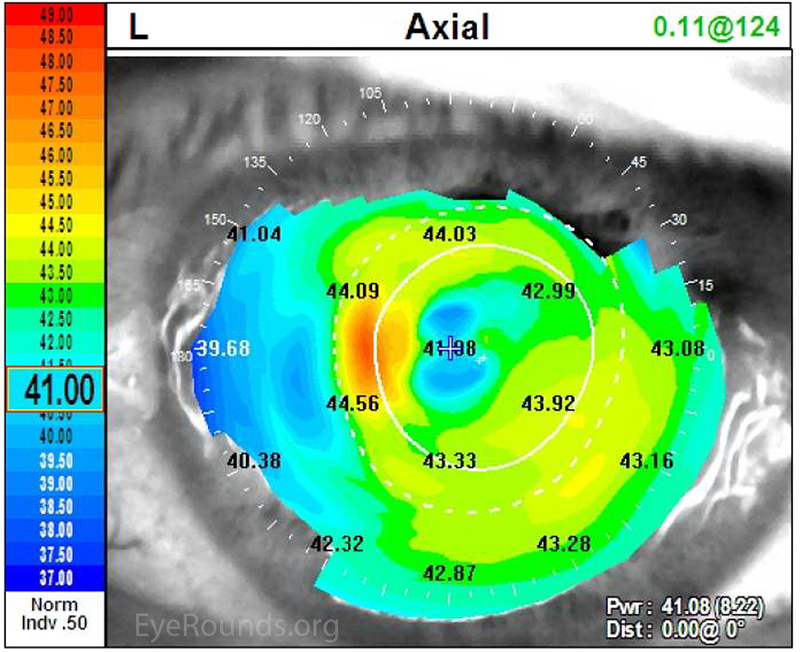 Uneven removal of normal and pathological tissue, in or adjacent to the visual axis, may induce irregular astigmatism that compromises visual rehabilitation, even in the setting of an optical clear visual axis. U.S. Food and Drug Administration-approved indications for PTK include superficial corneal scars, dystrophies, and degenerations, including band keratopathy. We tend to reserve the use of PTK for recurrent or more advanced cases of band keratopathy with dense, uniform involvement of the calcific deposits across the visual axis in the interpalpebral fissure (as in Figure 4). In this situation, the superior ability of the excimer laser to effectively and precisely remove the calcium offers the potential for a better visual outcome if appropriate precautions are taken to minimize an undesirable hyperopic shift or induction of irregular astigmatism, as described below. 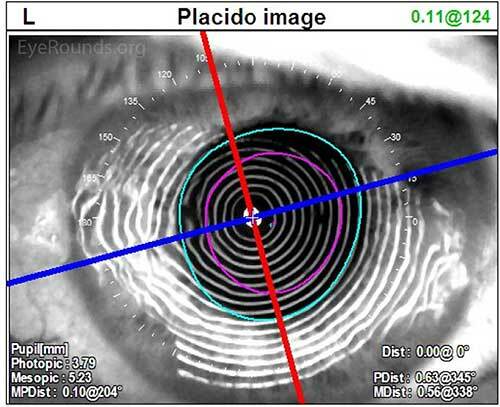 Conversely, we tend to avoid the use of PTK for paracentral band keratopathy or patchy involvement within the visual axis (as in Figure 2) where the procedure does not offer a superior visual outcome compared to manual techniques and poses a greater risk for induction of undesirable iatrogenic refractive changes. In cases where there may be residual calcium in the visual axis after manual removal (as in Figure 3), PTK "polishing" of the visual axis can be performed if care is taken to properly mask the non-involved stroma within the optical zone (as described below). The PTK technique begins by programming the desired ablation diameter and an ablation depth that will be more than sufficient to complete the procedure. The ablation diameter is set between 6.0 and 9.0 mm (as per the limits of the excimer laser model) to incorporate as much of the area of involvement as possible in the ablation zone. The laser depth can be set as high as 100 µm with the understanding that (1) calcium ablates much less effectively than stroma; (2) no stromal ablation will occur in the de-epithelialized zone as long until the calcium deposits remain confluent; and (3) no stromal ablation will occur in the de-epithelialized zone until at least 30 µm of ablation has taken place. A refractive correction should not be programmed, due to unpredictability regarding the amount of energy that will be required to remove the calcium deposits before Bowman's layer is even reached. After the therapeutic goals have been achieved, residual hyperopia and regular astigmatism can be corrected, if desired, during a subsequent procedure. Once the laser program is set, the corneal epithelium is manually removed above the area of calcium deposition in the interpalpebral fissure. The epithelium is left intact where there is no subepithelial calcium. Prior to initiating the PTK, the "protuberant" calcium is "smoothed" as much as possible with a 57 or 69 Beaver blade in order to facilitate a more uniform laser ablation. Immediately after drying the surface of the band keratopathy, the ablation is initiated and carried out to a depth of 30 µm or until the operating surgeon observes a break-up of the uniform confluent calcium pattern in the central cornea, whichever comes first. If the confluent calcium pattern is still present, a viscous lubricating drop (such as Celluvisc®) is applied to the epithelium outside the ablation zone to maintain corneal hydration. The surface of the cornea within the ablation zone is thoroughly dried, and the exposed calcium is once again "smoothed" with a Beaver blade. An additional 10 µm of ablation treatment is applied and the treatment is halted. This sequence is repeated until the confluent calcium pattern is lost and there is exposure of non-involved stroma within or adjacent to the remaining calcium. When the pattern of residual calcium and normal exposed stroma is reached (either with the initial 30 µm ablation or one of the subsequent 10 µm ablations), the procedure is modified. Once again, the corneal epithelium outside the ablation zone is covered with a viscous lubricating drop. The exposed calcium is again "smoothed" with a 57 or 69 Beaver blade. A non-viscous lubricating drop (e.g. Refresh®) is applied and meticulously spread over the ablation zone, taking care to ensure the peaks of the calcium deposits are exposed and the valleys of unaffected stroma are "masked" and protected from excimer laser energy. An additional 10 µm of ablation treatment is applied and the treatment is halted. This sequence is repeated until most, if not all, of the calcium deposits have been removed. At the conclusion of the procedure, mitomycin-C 0.2 mg/ml is applied with a pledget to the central cornea for 12 seconds and then thoroughly rinsed away to avoid unnecessary surface toxicity. A bandage soft contact lens is used, along with prophylactic topical antibiotics, until the epithelial defect has healed. Topical steroids (e.g. prednisolone acetate 1.0%) are used 4 times daily and tapered over 4 to 6 weeks. The prognosis for visual improvement and relief of symptoms is excellent following PTK for band keratopathy (5-9). More than 95% of patients experience partial or complete symptomatic relief. There will be improvement in best-corrected vision that is commensurate with the level of clearing of the deposits in the visual axis and posterior segment health. In many cases, an adjustment of the spectacle correction will be necessary to achieve the best visual outcome. In some cases, the use of the rigid hard contact lens may be required for maximum visual rehabilitation. In conclusion, both manual superficial keratectomy (with or without EDTA chelation) and excimer laser PTK are effective procedures for treating calcific band keratopathy. While manual treatment is suitable for all cases of band keratopathy, we prefer to reserve the use of PTK for cases with dense, uniform involvement of the visual axis, or as a "polishing procedure" when manual techniques cannot adequately clear the visual axis. If properly performed, surgical removal of band keratopathy is almost invariably associated with an excellent prognosis for visual improvement and symptomatic relief. Barouch FC, Colby K. Corneal and conjunctival degenerations. In: Smolin and Thoft's: The Cornea. Scientific Foundations & Clinical Practice. 4th Edition. Foster CS, Azar DT, Dohlman CH (editors). Philadelphia: Lippincott, Williams & Wilkins, 2005:875-877. Chang RI, Ching SST. Corneal and conjunctival degenerations. In: Cornea: Fundamentals, Diagnosis, and Management. Volume 1. 2nd Edition. Krachmer JH, Mannis MJ, Holland EJ (editors). Philadelphia:Elsevier Mosby, 2005:996-997. Kenyon KR, Gangadhar D, Pham LT, Goins KM, Wagoner MD. Superficial keratectomy. In: Duane's Clinical Ophthalmology. Tasman W and Jaeger EA (editors). Philadelphia: Lippincott, 2012. Najjar DM, Cohen EJ, Rapuano CJ, Laibson PR. EDTA chelation for calcific band keratopathy: results and long-term follow-up. Am J Ophthalmol 2004;137:1056-1064. Jhani V, Rapuano CJ, Vajpayee RB. 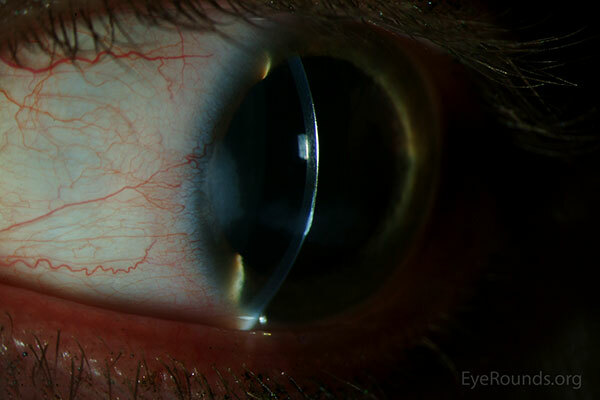 Corneal calcific band keratopathy. Curr Opin Ophthalmol 2011;22:283-289. Hersh PS, Wagoner MD. Excimer Laser Surgery for Corneal Disorders. New York/ Stuttgart: Thieme, 1998. Hersh PS, Klein S, Wagoner MD. Phototherapeutic keratectomy. In: Cornea. Volume 2. Surgery of the Cornea and Conjunctiva. 2nd Edition. Krachmer JH, Mannis MJ, and Holland EJ (editors). St. Louis: CV Mosby, 2005:1735-1747. O'Brart DP, Gartry DS, Lohmann CP, Patmore AL, Kerr Muir MG, Marshall J. Treatment of band keratopathy by excimer laser phototherapeutic keratectomy: surgical techniques and long-term follow up. Br J Ophthalmol 1993;77:702-708. Dighiero P, Boudraa R, Ellies P, Saragoussi JJ, Legeais JM, Renard G. [Therapeutic photokeratectomy for the treatment of band keratopathy]. J Fr Ophtalmol 2000;23:345-349.